I don’t get it. Ancillary Justice is by no means a bad book: it is competent, even rigorous, and despite some extensive longeurs it is also in places pacey and handily plot-driven. It has a certain singularity of voice, and something to say with it. It manages to tackle some big issues – gender, artificial intelligence, gestalt consciousness – with a real lightness of touch, an unshowy seriousness. It is solid. But I don’t get it. The buzz for Anne Leckie’s debut novel has been, in tonal quality, closer to a thrumming bass note from a Marshall stack. From advance notice to considered think pieces, reviewers have fallen over themselves to get excited about this big oil’ slice of space opera, as if its mix of interplanetary romance and high-concept mil-SF really is something to write home about. To take the temperature of large parts of SF fandom on the topic of this novel has been to send the mercury soaring. It has been, in fact, rather like the hoop-la a couple of years ago around the US publication of Kameron Hurley’s God’s War, a book with which, since it has now been published in the UK, Ancillary Justice has quirkily enough found itself competing on this year’s Clarke Award shortlist. Nevertheless, I’m not ooh-ing. My aahs are muted at best. I do not think Leckie has written a book as good as the punchily patchy God’s War, much less one about to reinvent the genre’s ratty old wheel. I don’t get it. And, then, dear reader, I paused. I ruminated. I checked the jerking of my knee. I’m as up for offering entertainment in the form of wilful gadflyery as (more than) anyone, but my tastes are so often peripheral not just to ‘core’ fandom but a certain literary subset of it that for once – just for once, mind – I wanted to understand. So I fired up Google, and I found Nina Allan at Arc. Leckie […] embraces the [science fiction] mission statement fully. 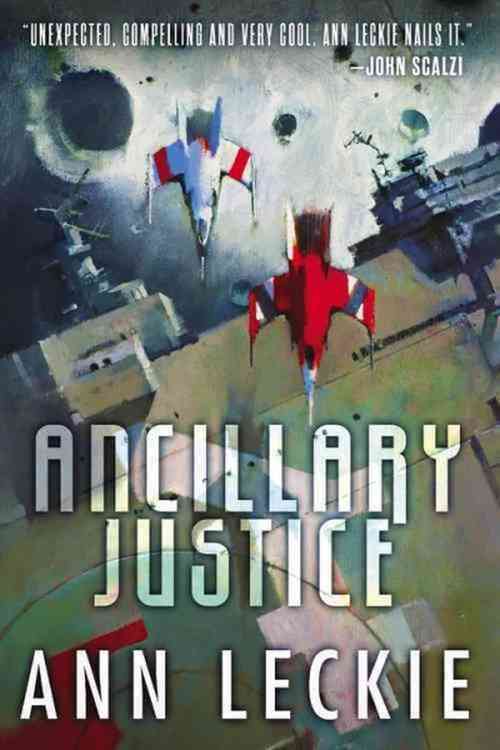 Ancillary Justice gives us teeming galaxies, evil empires, a version of warp drive, and all without a hint of irony as the commonly accepted imagery of the particular version of SF that ranges itself against the mainstream as “a literature of ideas”. When examined up close, however, the ideas contained in Ancillary Justice seem disappointingly simple: empires are evil, class systems are oppressive, absolute power corrupts absolutely. Ancillary Justice is an SF novel of the old school: tireless in its recapitulation of genre norms and more or less impenetrable to outsiders. The novel I happened to read immediately after Ancillary Justice was Kameron Hurley’s God’s War. Both novels are debuts, both are the first instalment in a trilogy. Both deal with far future empires, both have war as a central leitmotif, both have important things to say about society, faith and gender. At a surface level at least it would appear that these two books have much in common, but in fact, I would argue, they are different beasts entirely. This leaves the Clarke Award looking more like a commemoration of what science fiction likes than it often prefers to seem: where Ancillary Justice ports SFnal conceits, it doesn’t transform or even bend them out of shape very much. It’s comforting and well-meaning all at the same time. On that level, at least, perhaps I do get it, after all. Agreed on all points. The fandom’s “mind blowing” response to this book puzzles me. Yep, been reading sic fi for 50 (long) years – and you nailed it. This is one terrible book; sorry, but I call it as I see it. That leaves the bigger question of how it has won such acclaim. Either a new generation of reader is seeing something that my old, old, eyes can’t…or, as you hint, politics, social media, chimps writing hyperbole per the dollar, or plain dumb luck is at play….and if you really want a nauseous dose of fandom, go along to her website and see the comments there – but take some stemetil first. Good review. I had much the same reaction: okay book, but nothing mind-blowing, nothing new, and nothing particularly clever. The reaction around it and the defensiveness to any criticism surprises me.